LAUSD is committed to increasing our non-carbon based energy capacity through renewable energy sources. Current renewable energy systems on our campuses include solar and geothermal. As sunny Los Angeles provides an excellent environment for harnessing energy through solar panels, 59 campuses and 5 administrative sites have solar energy systems in place. In 2008, the District’s first solar photovoltaic project was installed at LAUSD's Pico Rivera Warehouse. This rooftop installation has the production capacity of one megawatt (MW) of energy, which is enough energy to power more than 160 homes for a year. The generation capacity of solar panels is measured in kilowatts (kW). One megawatt (MW) is the same as 1,000 kW. Kilowatt hours (kWh) are how we measure the use of that capacity over time. LAUSD has completed 67 total carport and rooftop arrays at 63 sites. In total, the sites have 21 MW of solar capacity, which is enough energy to power over 3,300 homes for one year. 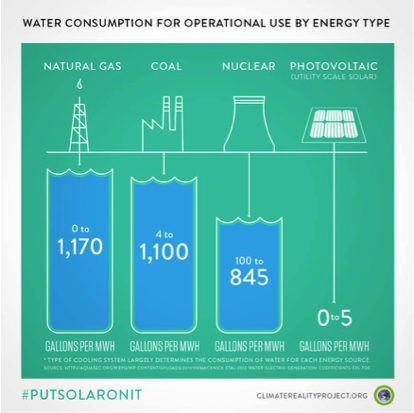 Solar energy saves water, too?